Tim McGraw will release his highly-anticipated 14th studio album Damn Country Music on November 6 on Big Machine Records. NASHVILLE, TN (September 17, 2015) – Music icon Tim McGraw will release his highly-anticipated 14th studio album Damn Country Music on November 6 on Big Machine Records. The record was produced by McGraw and trusted collaborator Byron Gallimore. Both the standard and deluxe editions of Damn Country Music are now available for pre-order atTimMcGraw.com along with several tiers of special packages, including a limited run of signed Taylor guitars, limited edition T-shirt, lithograph, sterling silver guitar pick necklace, and a 2016 Calendar, and the album. The album’s deluxe version will feature three bonus tracks. Damn Country Music’s lead single, “Top Of The World,” has been rocketing up the country radio charts since its out-of-this-world debut in August. 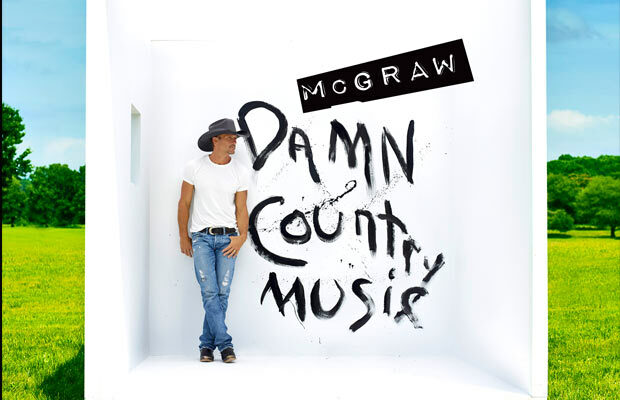 The song’s widely-viewed lyric video features an intimate look into McGraw’s life as he surveys various personal photos and memories. The release of Damn Country Music will cap off an exceptional year for McGraw, which began with a critically-acclaimed & trending performance of “I’m Not Gonna Miss You” from Glen Campbell: I’ll Be Me at the 87th Academy Awards on February 22. In April, McGraw was included on TIME 100 – Time Magazine’s list of the 100 most influential people – and narrated the ESPN Films & SEC Network documentary Shaq & Dale, which detailed the enduring relationship between basketball icon Shaquille O’Neal and his former Louisiana State University coach Dale Brown. Continuing to bolster his film career, McGraw starred in Disney’s Tomorrowland in May before kicking off his wildly successful Shotgun Rider tour in June. The tour thrilled thousands of fans and awarded mortgage-free homes to veterans through McGraw’s partnership with Operation Homefront & Chase in more than 30 cities throughout the summer. The tour will conclude on September 19 in Irvine, CA to a sold-out crowd. Tim McGraw has sold more than 40 million records worldwide and dominated the charts with 36 #1 singles. He’s won three Grammy Awards, 16 Academy of Country Music Awards, 14 Country Music Association Awards, 10 American Music Awards, three People’s Choice Awards and numerous other honors. His iconic career achievements include being named the BDS Most Played Artist of the Decade for all music genres and having the Most Played Song of the Decade for all music genres with “Something Like That.” He is the most played Country artist since his debut in 1992, with two singles spending over 10 weeks at #1 (“Live Like You Were Dying” and “Over and Over”). The single “Diamond Rings and Old Barstools” from SUNDOWN HEAVEN TOWN marks his 55th top ten hit. The project also produced the 4-week #1 “Shotgun Rider.” His current single “Top Of The World,” off his forthcoming 14th studio album, DAMN COUNTRY MUSIC, was released in August 2015 and has already begun its ascent on the charts. His critically acclaimed acting skills were highlighted in the award winning Friday Night Lights and The Blind Side. Tim most recently starred in Disney’s Tomorrowland. Connect with Tim at: TimMcGraw.com, Facebook.com/TimMcGraw, on Instagram @TheTimMcGraw, on Twitter @TheTimMcGraw, and onYoutube at youtube.com/TimMcGraw.